Is this just old or is it very old? One of just a few items from an hour of opshopping in Onehunga. This vase had some vinyl or whatever glued to the base so the mark was obscured. When removed I saw say stilt marks and an impressed or incised mark: it reads, to me, "JP/83". 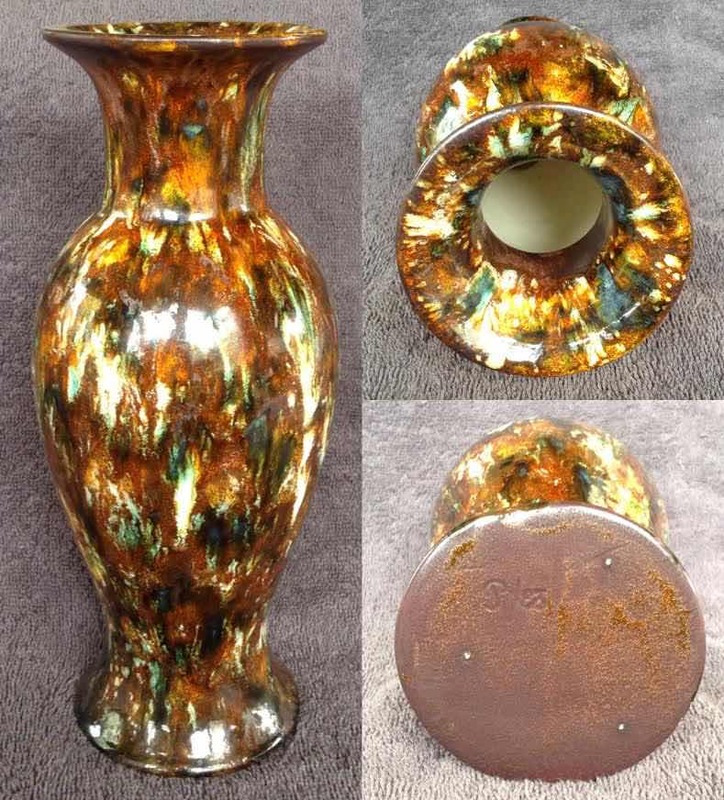 The glaze is multi-coloured, with some bubbles, some white ares, some matt areas, and a the look of a metallic fleck similar to an artificial material around in the 1970s that was called "moon stone". Two white spots centre at widest are reflections. The vase looks very old but assuming the marks are initials and a date (which they may not be) the date would be either 1983 or 1883. Re: Is this just old or is it very old? My thoughts are that it is Hobby Ceramics, as they used a lot of splotchy glazes or several glazes on a piece to put it another way. 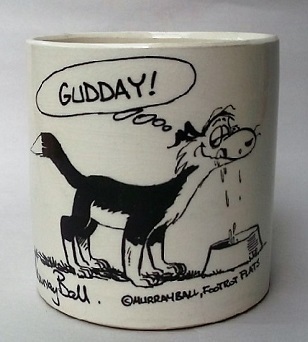 The probable 1983 would back this up, as Hobby Ceramics was big business then. With the obvious stilt marks I can see that Hobby Ceramics is something to consider but the mark is untypically neat and well formed, and I have yet to see a Hobby piece where someone has put so much effort into the glazing. It is also a bit heavier than I would expect from Hobby ware. I will have a look beyond page one of the greenware when I find time. What about this one Jeremy? Though it is 36cm high !! The one you linked to has more shoulder and less foot but I agree that it is certainly in the same ballpark. I think these greenware folk may alter their catalogs with availability so it may be one of theirs. The body is very white like those. So, a likely for greenware, but I don't think Hobby Ceramics with that particular glaze. I think of Greenware as a supplier for Hobby Ceramists and the clay is a low firing one that can take these types of glazes. When I saw the glaze I immediately thought of Hobby Ceramic glazes, not the old so call Majolica splendid ones like Milton Potteries.